The legislation in question is called the Omnibus Public Land Management Act. It was passed by both houses of Congress and signed into law by President Obama in the spring of 2009. 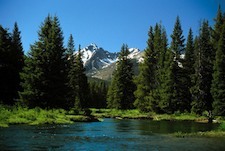 The Act protects some two million acres outright as wilderness in nine different states (California, Colorado, Idaho, Michigan, New Mexico, Oregon, Utah, Virginia and West Virginia) and requires the Bureau of Land Management to prioritize conservation on another 26 million acres of mostly Western lands. The bill also established three new national park units, a new national monument, three new national conservation areas, over 1,000 miles of national wild and scenic rivers, and four new national trails. With provisions appealing to sportsmen and conservationists alike, the bill enjoyed broad support; drafters took into account requests from dozens of constituent groups in putting together the legislation. As such, it is one of the most significant expansions of U.S. wilderness protection in the past quarter century. “This legislation guarantees that we will not take our forests, rivers, oceans, national parks, monuments and wilderness areas for granted, but rather we will set them aside and guard their sanctity for everyone to share,” President Obama said upon signing the bill into law. While the law doesn’t specifically address global warming in its language, environmentalists are overjoyed at the climate benefits that protecting so much land will bring. “Our forests store vast amounts of carbon in tree trunks, roots, leaves, dead wood and soils—a service that is becoming ever more essential as the threat of global climate change mounts due to the buildup of human-generated carbon dioxide and other greenhouse gases in the atmosphere,” reports the nonprofit Wilderness Society. Plants and trees utilize ground-level carbon dioxide as building blocks in photosynthesis. The more flora we leave growing naturally on the ground, the more greenhouse gas we can store (or “sequester”) there and prevent from drifting on up to the atmosphere where it can contribute to global warming. “Although investments in energy efficiency and clean energy will provide the only permanent solutions to climate change, forest sequestration can buy us time to develop those alternatives,” says the Wilderness Society, adding that American forests currently capture the equivalent of about one-tenth of the greenhouse gases put out by U.S. cars, factories and other sources. In addition, forests provide other key environmental benefits such as cleansing our air and water. In the absence of binding legislation mandating stricter carbon emissions standards, the Omnibus Public Land Management Act, given the climate-related benefits of land conservation, may well be the most significant global warming bill Congress has passed to date. And environmentalists might have to take what they can get: With Republicans now in control of the House and gaining ground in the Senate, dedicated climate legislation may be even more elusive than analysts thought even a year ago. EarthTalk® is written and edited by Roddy Scheer and Doug Moss and is a registered trademark of E – The Environmental Magazine (www.emagazine.com). Send questions to: earthtalk[at]emagazine.com. Subscribe:www.emagazine.com/subscribe; Free Trial Issue: www.emagazine.com/trial.